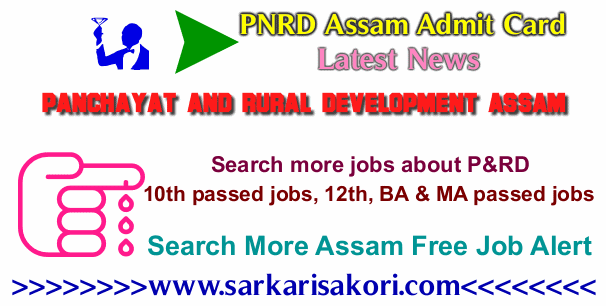 PNRD Assam Admit Card 2017 Download notification for Account Assistant, District & Block MIS Manager Screening Test (OMR) Admit downloading from Panchayat and Rural Development Assam (P&RD). MIS Manager (PMAY-G) under Department of Panchayat and Rural Development, Assam. No of Post: 46 Nos. Qualification: Candidates should be HSSLC passed under Commerce Stream. No of Post: 09 Nos. Qualification: Candidates should be MCA/BCA and experience in the related field is desirable. No of Post: 219 Nos. Qualification: Candidates should be BCA/BCIT/PGDCA with 1-year experience. * Full advertisement details about PNRD Assam Recruitment 2017. Those candidates found eligible with reference to advertisement to advertisement No-15/147/12/177 dated 14.8.2017 will have to appear in the above-mentioned examination as per programme is given below. (MGNREGA) Domain knowledge (IT & accountancy), Rural Development & Panchayatiraj, General knowledge, General English, Quantitative aptitude. 07-01-2018 10.30 AM to 12.00 Noon 100 Account Assistant Domain knowledge (Computer Aptitude & Accountancy), General English, General knowledge, Quantitative aptitude. (PMAY-G) Domain knowledge (Computer & IT), Rural Development & Panchayatiraj, General English, General knowledge, Quantitative aptitude. The Admit Card shall be uploaded to CPRD’s website (www.pnrdjobs.in and www.cprdassamjobs.in) on 27-12-17. The candidates shall have to download their own admit card from the aforesaid website. No intimation letter to the eligible candidates shall be sent separately by post. After that select, the post applied for, type your application no, date of birth, mobile no and then submit or click on go button to appear your admit card. Now download or print your admit card. Any query in this regards shall be entertained over telephone No 7086056467 and 9954498446 w.e.f. 30.12.17 to 04.01.18 during office hour. Directorate of Health Services Assam Recruitment 2017. Exam notification and admit download details. The shortlisted candidate list of District MIS Manager (MGNREGA). The shortlisted candidate list of Block MIS Manager (PMAY-G). It is for information of all concerned that the O/o State Institute of Panchayat & Rural Development, Assam will hold Multiple Choice Objective Type Screening Test (OMR based ) for engagement to the post of Accredited Engineer and Gram Panchayat Coordinator under Department of Panchayat and Rural Development, Assam. No of Post: 1850 Nos. Qualification: Candidates should have Diploma in Civil Engineering may be given preference. No of Post: 1083 Nos. Qualification: Candidates should be B.COM passed. 24-12-2017 10.30 AM to 12.00 Noon 100 Gram Panchayat Coordinator Domain knowledge (IT & accountancy), General knowledge, General English, Quantitative aptitude. 24-12-2017 2.00 PM to 3.30 PM 100 Accredited Engineer Domain knowledge ( Civil Eng), Computer Aptitude, General English, General knowledge, Quantitative aptitude. How to download admit: The Admit Card shall be uploaded to CPRD’s website (www.pnrdjobs.in and www.cprdassamjobs.in) on 12-12-17. For any query in this regards shall be entertained over mobile no 70786056467 during office hours w.e.f. 18-12-17 to 22-12-17. The eligible candidate list of Gaon Panchayat Coordinator. Examination Center Details Roll no wise examination center details of Gaon Panchayat Coordinator. The eligible candidate list of Accredited Engineer. Examination Center Details Roll no wise examination center details of Accredited Engineer. You will be interested more in PNRD Assam Admit Card 2017 Download & Latest Assam Govt Jobs Alert 2017.